Pura Kehen, or Kehen Temple, is an ancient 11th century temple located just north of Bangli. This temple is stunning with its eight terraces and hillside perch. 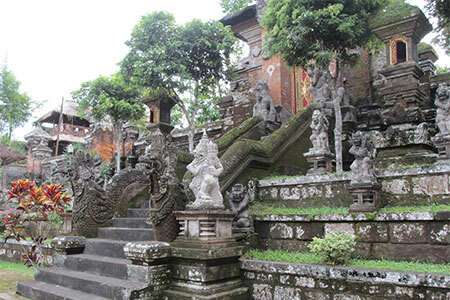 The Kehen temple is the largest, and arguably the finest, temple in East Bali. When you first reach the temple, you will climb a set of stairs lined with guardian statues of elephants representing figures from Balinese mythology before reaching the awe-inspiring entrance leading to three terraced courtyards, through finely carved and ornamented by a wonderful 400-year-old banyan tree with a monk’s cell built high up in the branches. The middle courtyard houses shrines, while the upper courtyard contains an 11-tiered meru, or tower, with a carved wood and stone base, dedicated to the temple god. On either side are other smaller merus, put in place for visiting mountain gods to rest after their journey. Throughout the temple are magnificent carvings, and visitors will want to take their time to really look at the details. Beautiful rice fields are the views on the way to this lovely temple.